Submitted by Brian on Wed, 03/24/2010 - 22:56. Any idea what year this is from? The architecture looks suspiciously like the building that is now Di Pilla's. Can anyone out there confirm that? I'd guess 1930s to 1940s. Submitted by night reader on Fri, 03/26/2010 - 22:10. I'd guess 1930s to 1940s. The design is 1930s, with deco elements but the Depression stripped it down and humanized it somewhat - the cartoon style was popular then, too. Architecture was shifting away from deco towards what would become the international style. It could be the 1940s because the artist may have stuck with an old style. 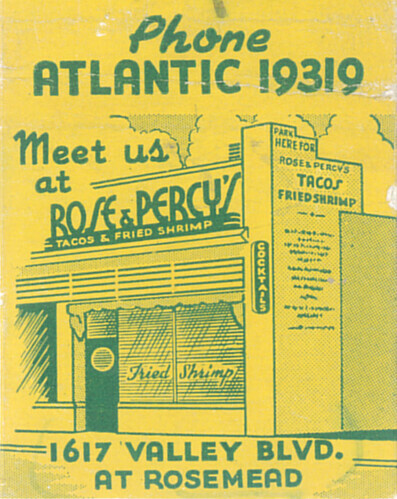 The address maps out to where the wash meets Valley - but, the text says "Valley at Rosemead" which is where DiPilla's is. The street numbers probably changed.